Portofino Resources has 3 lithium brine projects in Argentina, 2 of which are undergoing exploration right now. The most promising project will see drilling, probably in June. The drill program is fully-funded. Strong surface & near-surface sampling from 18 sites across 1,804 hectares returned strong results, up to 1,031 mg/L Li. 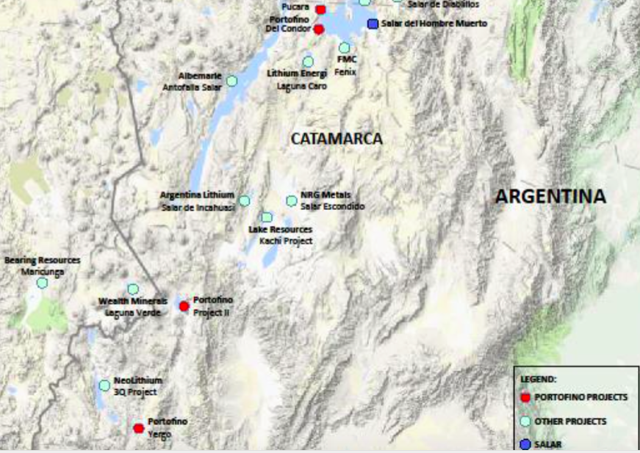 Speaking of Catamarca, that’s where CEO David Tafel’s company Portofino Resources (TSX-V: POR) controls 3 projects totaling > 8,600 hectares. One of the Projects is very near the projects of POSCO & Galaxy. Another is near Neo Lithium’s very high-grade 3Q project. I recognize I’m name dropping and playing the close-ology game, but Portofino​ ​has 3 shots at glory. ​Three​ legitimate chances of finding good, or even high-grade lithium deposits. Yet its market cap is just C$2M. This seems like attractive risk/reward to me. Sure. Portofino Resources holds an interest in 3 lithium property groups in Argentina representing over 8,600 hectares. Our projects are located within the world-renowned “Lithium Triangle”, specifically focused in Catamarca Province, Cwhich was ranked by the Fraser Institute Annual Survey of Mining Companies, 2018, as the best mining province in Argentina. The Hombre Muerto West project is our most advanced and is within Argentina’s most prolific producing lithium brine Salar. We have a team on site that should complete a geophysical survey by the end of April. This is a follow up on encouraging lithium results achieved during last year’s surface sampling. The present program will help define the extent of brine in the sub-surface, which will be used to define targets for initial drilling. We expect to generate at least 2 or 3 drill targets from the geophysics. Drilling could commence immediately following interpretation of the survey results. 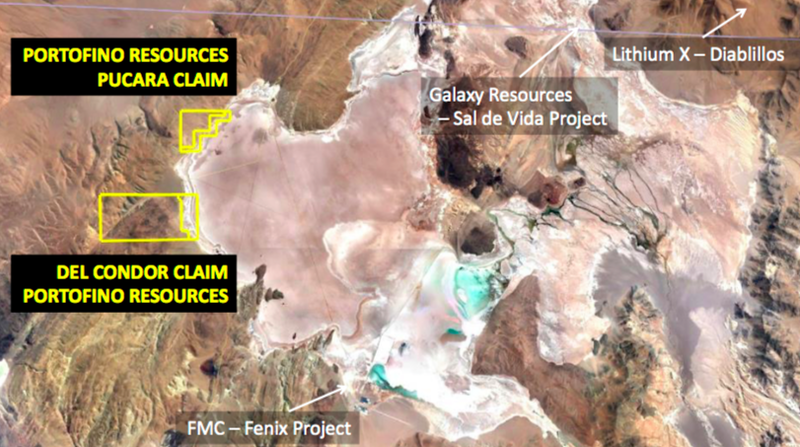 Our Hombre Muerto West project is located within the best known and top producing lithium brine Salar in Argentina. Galaxy Resources recently sold a portion of their holdings in the Salar to POSCO for US$280 million(US$16,000 per hectare!). In 2018, our geological team sampled 18 sites in a near-surface auger program. Six samples were over 700 mg/L lithium and the highest sample returned 1,031 mg/L lithium plus 9,511 mg/L potassium. The samples also contained low impurity levels, including low magnesium. 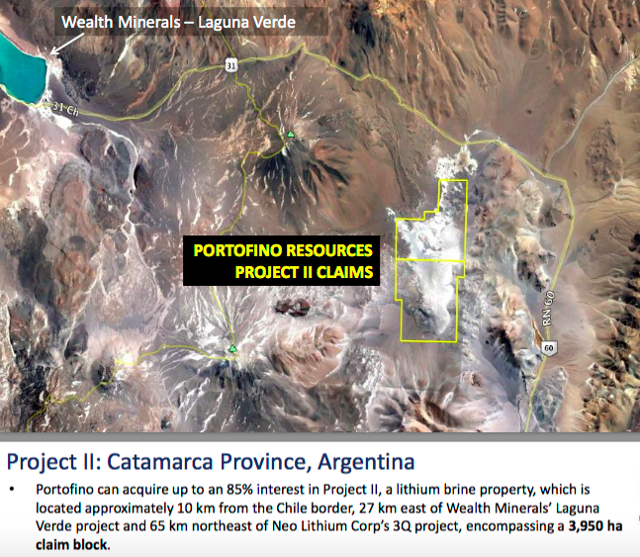 Portofino can acquire 85%of Project II, which is 3,950 hectares in size, located approximately 10 km from the Chile border, and 65 km northeast of Neo Lithium Corp’s well known 3Q project. Historical exploration work included near-surface auger brine samples that averaged 274 mg/L lithium, with several in excess of 300 mg/L lithium. Neo Lithium’s deposit is very high-grade with very low impurities. Our geological team just completed an initial sampling & mapping exploration program at Yergo. We believe there are common characteristics. Once we have had a chance to review the results, we will be in a better position to comment further on commonalities. Disclosure: I am/we are long PFFOF.